Negative thermal expansion (NTE) behaviors in the materials with giant magnetocaloric effects (MCE) have been reviewed. Attentions are mainly focused on the hexagonal Ni2In-type MM'X compounds. Other MCE materials, such as La(Fe,Si)13, RCo2, and antiperovskite compounds are also simply introduced. The novel MCE and phase-transition-type NTE materials have similar physics origin though the applications are distinct. Spin-lattice coupling plays a key role for the both effect of NTE and giant MCE. Most of the giant MCE materials show abnormal lattice expansion owing to magnetic interactions, which provides a natural platform for exploring NTE materials. We anticipate that the present review can help finding more ways to regulate phase transition and dig novel NTE materials. 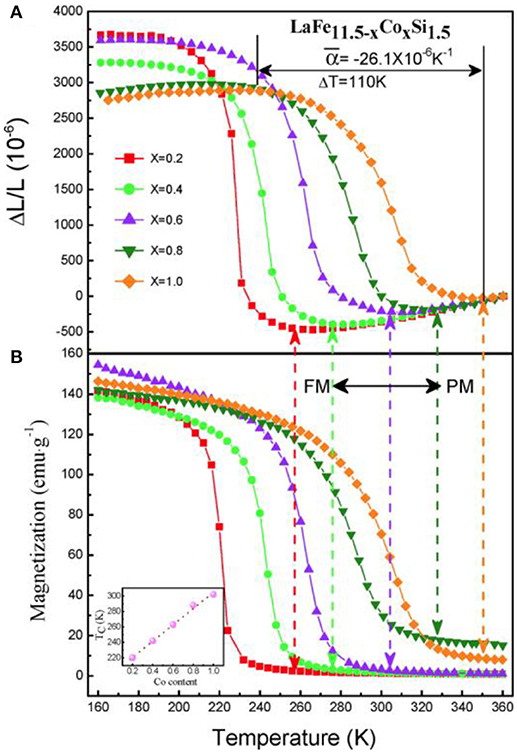 Magnetic cooling technique based on magnetocaloric effect (MCE) has attracted an increasing attention for its environmental-friendly and energy-saving superiority compared to conventional vapor compression technique (Annaorazov et al., 1996; Pecharsky and Gschneidner, 1997; Hu et al., 2000a, 2001; Wada and Tanabe, 2001; Tegus et al., 2002; Fujita et al., 2003; Gschneidner et al., 2005; Krenke et al., 2005; Shen et al., 2009; Liu E. K. et al., 2012; Liu J. et al., 2012; Wu et al., 2015). The discovery of giant MCE materials, such as FeRh (Annaorazov et al., 1996), Gd5Si2Ge2 (Pecharsky and Gschneidner, 1997; Gschneidner et al., 2005), La(Fe,Si)13 (Hu et al., 2001; Fujita et al., 2003; Shen et al., 2009), MnFeP(As,Ge) (Tegus et al., 2002), MnAs (Wada and Tanabe, 2001), NiMn-based Heusler alloys (Hu et al., 2000a; Krenke et al., 2005; Liu J. et al., 2012), Ni2In-type MM'X compounds (Liu E. K. et al., 2012; Wu et al., 2015), has promoted the developing of solid-state magnetic refrigeration technique. A common feature of these materials is the strong spin-lattice coupling. In other words, magnetic and structural transition concurrently takes place, and the change of lattice during the transition does contribute to the giant MCE. Note that a number of MCE materials show abnormal lattice expansion owing to magnetic interactions, which provides a natural platform for exploring negative thermal expansion materials. However, not all the giant MCE materials show negative thermal expansion (NTE), some of them still show positive thermal expansion (PTE), depending entirely on the characteristics of the magnetostructural/magnetoelastic transition and the specific physical origin in different systems. For example, FeRh alloy shows giant MCE. It crystallizes in the CsCl-type cubic structure and experiences PTE with volume change of ΔV/V~ + 0.9% along with the AFM-FM (antiferromagnetic-ferromagnetic) transition without the change of space group. Gd5Si2Ge2 also exhibits giant MCE (Pecharsky and Gschneidner, 1997), which originates from a coupled magnetostructural transition in which slabs of a well defined arrangement of R and T atoms shift ~0.5Å with respect to one another along the a-axis when the transition occurs under the influence of temperature (Gschneidner et al., 1997; Morellon et al., 2000). Such a shift gives rise to a PTE with volume change of ΔV/V ~ + (0.4–1)% depending on the compositions. MnFeP1−xAsx (0.15 < x < 0.66) alloys with giant MCE crystallize in hexagonal Fe2P-type structure and undergo a first-order FM-PM (paramganetic) magnetic transition around room temperature (Tegus et al., 2002). The space group (P6- 2m) keeps unchanged upon the magnetic transition, but the lattice shows an anomaly expansion in the direction of the a and b axes and a contraction of the c axis as the FM phase is formed, which originates from an increase in the intralayer metal-metal bond distance (Liu et al., 2009). As a result, a PTE with ΔV/V ~ + 0.06% was observed with increasing temperature. The FM Heusler alloy Ni2MnGa with L21 structure shows a giant MCE owing to the martensitic magnetostructural transformation from FM austenitic to FM martensitic phase (Wada and Tanabe, 2001). On heating, the alloy displays a PTE with ΔV/V ~ + 1%. However, the La(Fe1−xSix)13-based materials with giant MCE show NTE with ΔV/ V~ – (1.0–1.6)% around TC, depending on compositions, due to the itinerant ferromagnetic nature of the materials (Shen et al., 2009). The space group (Fm3- c) keeps unchanged across the magnetic transition. Moreover, the hexagonal MnCoGe/MnNiGe-based compounds also show giant MCE and NTE. The optimal compositions undergo a magnetostructural transition from a Ni2In-type hexagonal PM phase (space group P63/mmc) to a TiNiSi-type orthorhombic FM phase (space group Pnma). The c axis of hexagonal phase expands while the a-axis contracts upon the martensitic structural transition. As a result, NTE as large as ΔV/V = –(2.68–3.9)% occurs depending on compositions (Liu E. K. et al., 2012; Wu et al., 2015; Zhao et al., 2015). Materials with precise thermal expansion or zero thermal expansion (ZTE) are in urgent demand in modern industry (Rathmann et al., 1968; Namba et al., 2001; Du et al., 2016), such as engineered components, optical mirrors, and printed circuit boards. Generally, ZTE can be reached by combining the materials with PTE and NTE coefficients. To meet various demands, lots of efforts have been made to search for NTE materials, and a number of materials have been discovered showing giant NTE, e.g., ZrW2O8 (Mary et al., 1996), CuO nanoparticles (Zheng et al., 2008), (Bi,La)NiO3 (Azuma et al., 2011), PbTiO3-based compounds (Chen et al., 2011), antiperovskite manganese nitrides (Takenaka and Takagi, 2005; Iikubo et al., 2008; Sun et al., 2010a; Song et al., 2011; Wang et al., 2012; Lin et al., 2015), La(Fe,Co,Si)13 (Huang et al., 2013), MnCoGe-based materials (Zhao et al., 2015), and reduced Ca2RuO4 (Takenaka et al., 2017). Among these NTE materials, the phase-transition-type materials (Takenaka and Takagi, 2005; Iikubo et al., 2008; Sun et al., 2010a; Song et al., 2011; Huang et al., 2013; Zhao et al., 2015) have attracted specific attention. In this paper, we mainly review the negative thermal expansion behaviors based on magnetostructural or magnetoelastic transition in the materials showing giant magnetocaloric effect. Here, the magnetostructural transition refers to the concurrent magnetic and structural transition where the lattice structure (space group) changes during the transition, while the magnetoelastic transition refers to the concurrent magnetic and elastic transition where the lattice structure (space group) remains unchanged but lattice parameter changes elastically. LaFe13 does not exist due to the positive formation enthalpy between La and Fe. To get LaFe13-based alloys, a third element is needed. The first stable LaFe13−xMx compounds were made by Krypiakewytsch et al. (1968) in 1968 when Fe was partially replaced by Si or Al. The compounds show cubic NaZn13-type structure with space-group of Fm3¯c. In the structure, La atoms occupy the 8a site, while Fe atoms occupy the 8b and 96i sites. Fe atoms at these two sites are denoted as FeI and FeII, respectively. Al or Si randomly substitute for FeII site. 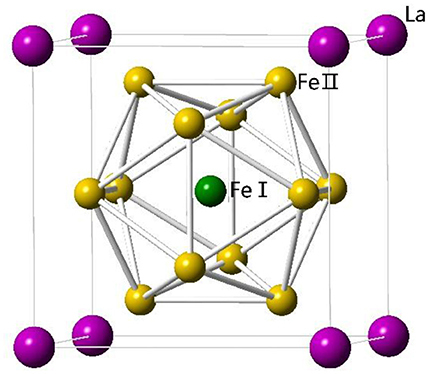 Fe atoms at FeI site and La form a CsCl structure. The FeI are surrounded by an icosahedron of 12 FeII, and the FeII are surrounded by nine nearest FeII and one FeI, as shown in Figure 1. Figure 1. Crystal structure of NaZn13-type La(Fe,X)13 compounds. By analyzing phase formation rule of NaZn13-type compounds, LaFe13−xSix compounds with Si content ranging from x = 1.2 to 2.4 were successfully synthesized (Hu, 2002; Shen et al., 2009). In 2001, we firstly reported the large MCE in LaFe11.4Si1.6, originating from a negative lattice expansion and a field-induced itinerant-electron metamagnetic transition (Hu et al., 2001). The maximal magnetic entropy change, –ΔS, reaches 19.4 J kg−1K−1 around 213 K under a magnetic field change of 0-5T, largely exceeding that of LaFe10.4Si2.6 with typical second-order transition, as shown in Figure 2A. The differential curves given in the inset of Figure 2A clearly illustrates the asymmetrical broadening of –ΔS peak caused by the field-induced itinerant-electron metamagnetic transition. 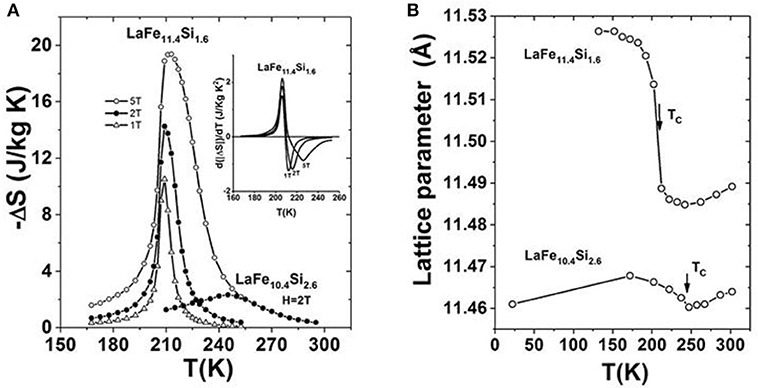 Figure 2B displays the comparison of lattice change around phase transition between LaFe11.4Si1.6 and LaFe10.4Si2.6. One can notice, for LaFe11.4Si1.6, the negative expansion of lattice parameter can be as much as −0.4%. Figure 2. (A) Magnetic entropy change –ΔS of LaFe11.4Si1.6 compared with LaFe10.4Si2.6. The differential curves of –ΔS for the former is given in the inset. (B) Temperature dependence of lattice parameter of LaFe11.4Si1.6 compared to that of LaFe10.4Si2.6. Reprinted with permission from Hu et al. (2001). Introducing the substitution of Co for Fe or interstitial atoms C/H can both impact the exchange coupling between the magnetic elements. This fact can adjust the temperature of phase transition in a wide temperature range covering room temperature while a large MCE is maintained. 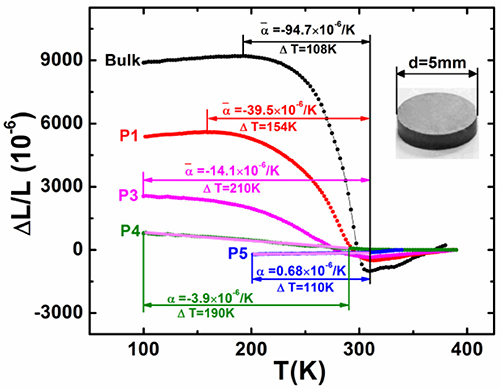 The maximal room temperature –ΔS can reach 12 J kg−1K−1 and 20 J kg−1K−1 under 2 T and 5 T magnetic fields, respectively, for the typical La(Fe,Si)13-based compounds (Hu et al., 2002; Shen et al., 2009). The large MCE make the La(Fe,Si)13-based compounds attractive to be as room temperature refrigerants. For La(Fe1−xCox)11.9Si1.1 (Hu et al., 2002, 2005), the –ΔS is one times larger than the conventional refrigerant Gd, and is comparable or even exceeds that of Gd5Si2Ge2, the milestone MCE material discovered in 1997 (Pecharsky and Gschneidner, 1997). The large MCE is closely related to negative lattice expansion across phase transition, which can be identified in the temperature dependence of lattice parameter for La(Fe1−xCox)11.9Si1.1 (x = 0.04, 0.06, 0.08) compounds (Figure 3). Figure 3. 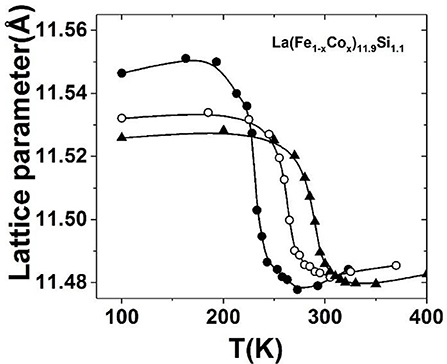 The temperature dependence of lattice parameter for La(Fe1−xCox)11.9Si1.1 (x = 0.04, 0.06, 0.08) compounds. Reprinted with permission from Hu et al. (2005). Although the large MCE of La(Fe,Si)13-based compounds owing to the significant negative lattice expansion was discovered in the early 2000 (Hu et al., 2000b; Shen et al., 2009), these materials have never been considered as negative thermal expansion (NTE) materials till 2013. As NTE materials, Huang et al. firstly reported the giant NTE in La(Fe,Si,Co)13 compounds (Huang et al., 2013). For LaFe13−xSix, the NTE properties were found to be strongly dependent on the Si contents. A sharp volume change from 170 to 240 K was observed in LaFe11.5Si1.5 with a NTE temperature window (ΔT) about 70 K. The estimated ΔL/L is 3.5 × 10−3, which is comparable to those of Mn3ZnN (4.6 × 10−3) (Takenaka and Takagi, 2005) and Mn3GaN (3.8 × 10−3) (Takenaka et al., 2008). With increasing Si content from x = 1.5 to 2.4, the linear expansion becomes broader gradually, leading to a large negative slope in a wider temperature range. This result illustrates that the replacement of Fe by Si can broaden the temperature window of NTE. However, the numerical values of NTE coefficient rapidly drop with the increase of Si content, which is an unfavorable character for practical applications. To improve the performance of NTE behavior, the substitution of Co for Fe was introduced. Figure 4 displays linear thermal expansion as a function of temperature and its comparison with magnetization for LaFe11.5−xCoxSi1.5. Increasing Co content broadens the temperature window, ΔT, of NTE, and drives it to a higher temperature. The ΔT width of NTE is 74 K, 90 K, and 110 K for x = 0.2, 0.4, and 1.0, respectively. More importantly, the change of ΔL/L within the NTE window reduces less rapidly with Co compared to the case with Si. The composition with x = 0.10 produces an average coefficient of thermal expansion (CTE) of α- = −26.1 × 10−6 K−1 from 240 K to 350 K, covering room temperature. This numerical value of α- is about 3 times larger than that of the commercial NTE materials ZrW2O8 with α = −9 × 10−6 K−1. Moreover, the absolute value of the negative CTE reaches those of high-expansion metals such as Al (α = 23 × 10−6 K−1 at room temperature). These findings suggest the potential application of La(Fe,Si)13-based compounds as NTE materials. Figure 4. 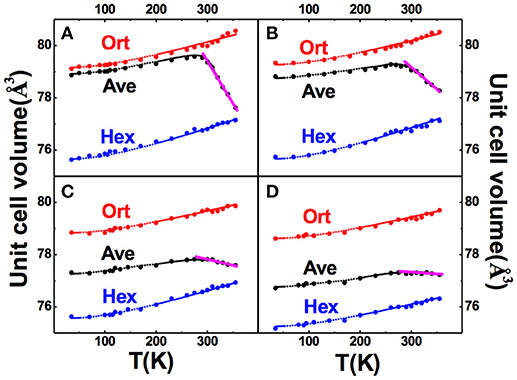 Temperature dependence of (A) linear thermal expansions ΔL/L (reference temperature: 360 K) compared to (B) the magnetization for LaFe11.5−xCoxSi1.5 (x = 0.2, 0.4, 0.6, 0.8, and 1.0). Reprinted with permission from Huang et al. (2013). More interestingly, zero thermal expansion (ZTE) has been recently reported in La(Fe,Si)13-based compounds in a wide temperature range away from phase transition (Li et al., 2017), which is a fascinating phenomenon in these compounds. Hexagonal Ni2In-type MM'X (M, M' = transitional element, X = main element) compounds have attracted lots of attention owing to the rich magnetic and structural behaviors. Ferromagnetic or antiferromagnetic coupling occurs depending on the compositions and atomic local environments (Niziol et al., 1981; Caron et al., 2011; Gercsi et al., 2011; Liu E. K. et al., 2012). As a member of family, the stoichiometric MnCoGe alloy undergoes diffusionless martensitic structural transition, Tstru, from Ni2In-type hexagonal (space group: P63/mmc) to TiNiSi-type orthorthombic (space group: Pnma) structure at Tstru ~420 K and a transition of ferromagnetic ordering at Tc~345 K (Niziol et al., 1981). Both the martensitic and austenitic phases display ferromagnetic nature, and the orthorhombic phase shows a higher magnetic moment Ms ~4.13 μB than the hexagonal phase (Ms ~2.76 μB) (Niziol et al., 1981). On the other hand, the stoichiometric MnNiGe undergoes a similar martensitic structural transformation at Tstru~470 K, and a magnetic transition at TNM ~346 K. The martensitic and austenitic phases have distinct magnetic structure. The former shows spiral antiferromagnetic (AFM) coupling with Neel temperature TNM at 346 K while the latter exhibits ferromagnetic (FM) nature with intrinsic Curie temperature TCA at 205 K (Niziol et al., 1981). Figure 5 shows the sketches of orthorhombic martensitic and hexagonal austenitic structures for MnCoGe (Wu et al., 2015). Figure 5. The sketches of (A) orthorhombic martensitic and (B) hexagonal austenitic structures. The black lines in (A) enclose one unit cell of TiNiSi-type orthorhombic structure while the purple lines in (B) enclose the one of Ni2In-type hexagonal structure. The unit cell of hexagonal phase transforms into the zigzag-type structure in the orthorhombic phase, as indicated by purple lines in (A). For the MM'X compounds, austenitic phase has a smaller volume than martensitic phase. This fact prompts one to think that the introduction of smaller atoms or vacancies may stabilize the austenitic phase and shift Tstru to a lower temperature. Following this way, magnetostructural transition has been indeed realized by introducing smaller atoms or vacancies, such as MnCo1−xGe (Wang et al., 2006), Mn1−xCoGe (Liu et al., 2010), Mn1−xCrxCoGe (Caron et al., 2011). Moreover, It has demonstrated that valence electron concentration (e/a) can also affect Tstru. By introducing Indium (In) atom (2.00 Å, 5s25p1) with a larger radius but fewer e/a to replace Mn (1.79 Å, 3d54s2), Co (1.67 Å, 3d74s2), or Ge (1.52 Å, 4s24p2), magnetostructural transition is also created in (Liu E. K. et al., 2012). As a result, large MCE has been observed in these MnCoGe-based materials. On the other hand, it has been found that, for MnNiGe, the AFM coupling in the martensitic structure is not robust. The replacements of Mn or Ni by Fe atom can convert the AFM into FM coupling and stabilize the austenitic phase (Liu E. K. et al., 2012). As a result, the Tstru shifts to low temperature, and magnetostructural transition is realized and hence large MCE appears in an extended temperature window from 350 K down to 70 K in MnFeNiGe alloys. Moreover, giant barocaloric effect has been demonstrated in MnCoGe0.99In0.01 compound (Wu et al., 2015). Neutron powder diffraction (NPD) studies indicated that the lattice of hexagonal phase expands significantly along the c-axis (cH) by 11.3% while contracts along the a-axis (aH) by −6.8% during the magnetostructural transformation, Tmstru. As a result, negative lattice expansion as large as ΔV/V = (Vortho/2-Vhex)/Vhex~ −3.9% occurs for MnCoGe0.99In0.01, as shown in Figure 6. Note that the unit cell volume and lattice constants of hexagonal and orthorhombic phases have relations as ao = cH, bo = aH, co = √3aH and VO = 2VH. Figure 6. Lattice constants and unit-cell volume of hex. and orth. structure as a function of temperature for MnCoGe0.99In0.01. The blue and red symbols correspond to the hex. and orth. structure, respectively. The red circle, red square and red rhombus stand for ao, co/√3 and bo, respectively. The blue pentagon and blue star represent the ch and ah, respectively. The unit-cell volume of hex. and half of unit-cell volume of orth. structure are symbolized as blue and red triangle, respectively. Reproduced under a Creative Commons Attribution 4.0 International License from Wu et al. (2015). The calorimetric measurements using a differential scanning calorimeter (DSC) revealed that the total change of transition entropy can be as large as 55 J kg−1K−1 contributed by the large difference of internal energy across the transition for MnCoGe0.99In0.01. High resolution NPD studies under hydrostatic pressure revealed that pressure can shift the Tmstr to lower temperature at a rate of 7.7 K/kbar. The large latent heat and high sensitivity of the magnetostructural transition to pressure result in giant inverse barocaloric effect (Wu et al., 2015). The entropy change, ΔS, and adiabatic temperature change, ΔTad, under a pressure of 3 kbar reaches 52 J kg−1K−1 and −18 K, which exceed those of most materials, including the giant magnetocaloric effect driven by a magnetic field of 5 T (Gschneidner et al., 2005) that can be only available by superconducting magnets. The refrigeration cooling power (RCP) reaches 1190 J kg−1. Similar to the case of La(Fe,Si)13-based compounds, the Ni2In-type MM'X compounds have rarely been considered as negative thermal expansion (NTE) materials because of the limited temperature region of phase transition, though they surely have significant negative lattice expansion and large MCE and barocaloric effect owing to the magnetostructural transition. In 2015, Zhao et al. firstly reported giant NTE in bonded MnCoGe-based materials (Zhao et al., 2015). The as-prepared compounds are very brittle and even collapse into powders during preparation. Through introducing a few amounts (3–4 wt%) of epoxy to bond the powders, residual stress was introduced, hence the structural transition was broadened due to the lattice softening enforced by the stress. Hence, giant NTE has been achieved in a wide temperature region. Moreover, excellent mechanical properties and tunable electrical conductivity has been demonstrated for the bonded powders. Neutron powder diffraction (NPD) studies indicate that the change of lattice volume during the magnetic transition can be as much as 3.9, 3.9, and 3.8% for MnCoGe1−xInx (x = 0.01, 0.02), and MnCoGe0.97Sb0.03, respectively. Accordingly, the evaluated linear expansion is equal to ΔL/L ~10,995 × 10−6 and the average NTE coefficient is about α- ~ −183.3 × 10−6/K if the polycrystalline powder is supposed to expand isotropically for MnCoGe0.99In0.01. Linear expansion, ΔL/L, was measured using high resolution strain gauge for the bonded plates. It was found that the ΔL/L behaves isotropically, independent of the in-plane measured axis. Figure 7 shows the ΔL/L as a function of temperature for some typical compositions. The maximal ΔL/L keeps above 10,231 × 10−6, while the average linear NTE coefficient ranges from −51.5 × 10−6/K to −94.7 × 10−6/K in the tunable temperature region from ~60 to 330 K covering room temperature for the bonded MnCoGe-based materials with different compositions. Because of the significant broadening of phase transition caused by residual stress and the possibly porosities introduced, the ΔL/L and α- are somewhat smaller than those estimated from the X-ray diffraction (XRD) or NPD measurements. However, the maximal ΔL/L measured has reached 93% of the crystallographic value. These novel NTE properties are over the performance of most other reported materials previously. For example, the average α- ~ −51.5 × 10−6/K with operation temperature window as wide as 210 K was observed in MnCo0.98Cr0.02Ge, which is more than 5 times larger than that of the commercial NTE materials ZrW2O8 with α¯ = −9 × 10−6/K.1 More interestingly, in the temperature region from 250 to 305 K covering room temperature, the CET α (−119 × 10−6/K) remains nearly independent of temperature (see Figure 7A), and this value is about 40% larger than the that (−82 × 10−6 /K) of Bi0.95La0.05NiO3 (320–380 K) (Azuma et al., 2011), and more than four times larger than the α (−25 × 10−6 /K) of an antiperovskite manganese nitride (316–386 K) (Takenaka and Takagi, 2005). Figure 7. Temperature dependent linear thermal expansions ΔL/L (the reference temperature is 390 K) for bonded samples with various compositions (A) Mn0.97In0.03CoGe, MnCo0.98Cr0.02Ge, and (B) MnCoGe0.99, MnCoGe0.99In0.01. Reprinted with permission from Zhao et al. (2015). Figures 8A,B presents the temperature dependence of magnetization (M-T curves) measured under a 0.3 T magnetic field for the bonded and as-prepared compositions with and without magnetostructural coupling. From Figure 8 and the dM/dT plots in the insets, one can distinguish that the structural/magnetostructural transformation (Tstru/Tmstru) was significantly broadened while the pure magnetic transition keeps unchanged around TC for the bonded samples. 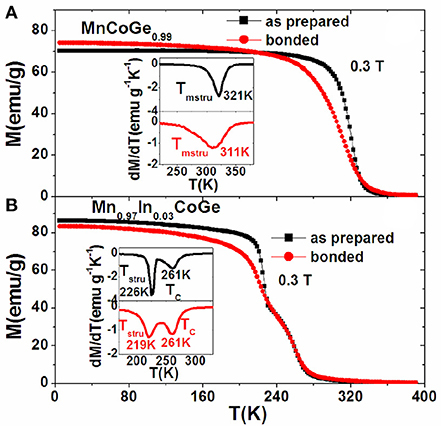 For the bonded MnCoGe0.99 with magnetostructural transition, the Tmstru shifts by 10 K to low temperature, while for the Mn0.97In0.03CoGe with decoupled Tstru and TC, the Tstru shifts by 7 K to low temperature while TC keeps unchanged (261 K). The significant broadening of the structural/magnetostructural transformation enforced by the residual stress governs the NTE behavior in the bonded samples. Figure 8. 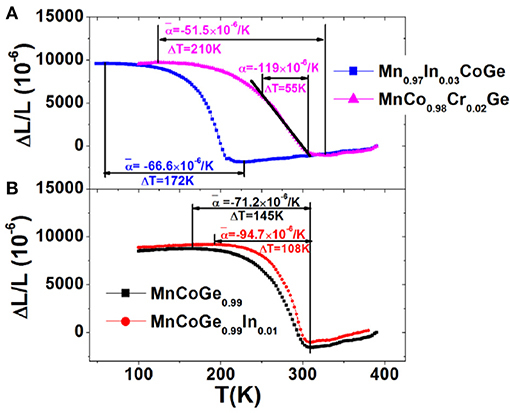 The comparison of temperature dependent magnetization under 0.3T for the bonded and as-prepared compositions (A) MnCoGe0.99 with magnetostructural coupling and (B) Mn0.97In0.03CoGe with decoupled Tstru and TC. The insets show corresponding dM/dT plots. Reprinted with permission from Zhao et al. (2015). From viewpoint of industry, electrical conductivity is a critical parameter for practical applications. For the bonded MnCoGe-based materials, the electrical conductivity can be adjusted through choosing distinct binders. It has been experimentally demonstrated that the electrical resistivity for the materials with Ag-epoxy as binder is lower than the one with epoxy as binder by 3 orders of magnitude. Moreover, the mechanical properties have been largely improved. All these suggest the high potential of MnCoGe-based compounds as NTE materials, which can be used to compensate the materials with high PTE, such as the popularly-used organic or plastic materials. The martensitic structural transition in Ni2In-type MM'X compounds behaves extremely sensitive to pressure compared to magnetic field (Wu et al., 2015). The introduced residual strain and defects during pulverization (Wu et al., 2016) or cold pressing (Liu et al., 2015) can also affect the magnetostructural coupling besides hydrostatic pressure. It has been reported that the introduced residual strain in the MnCoGe1−xInx thin slices prepared by cold pressing can stabilize the austenite phase, as a result, the temperature window of martensitic transformation is broadened, the magnetic and structural transition becomes decoupling (Liu et al., 2015). Similarly, with reducing particle size, austenitic phase becomes stable and a high fraction of austenitic phase loses the martensitic transformation, and retains the hexagonal FM structure in the entire temperature range. Considering the large difference of volume between austenitic and martensitic phases, one may prompt to think that adjusting phase fraction and magnetostructural transition through residual strain can lead to controllable NTE or even ZTE. Indeed, ultra-low thermal expansion has been realized in the giant NTE material MnCoGe0.99In0.01 by controlling the crystallinity degree and phase transition (Shen et al., 2017). A high fraction of sample can be converted into amorphous structure by ball milling, which turns to show PTE while the remained crystallites exhibit decreased NTE in an extended temperature window. Ultra-low thermal expansion can be reached and the NTE can be totally adjusted through self-compensation effect. Samples with different particle sizes were made through energetic ball milling. For small particles, high-resolution TEM (transmission electron microscopy) images indicate the mixture of a high fraction of amorphous structures and nanocrystallites full of atomic defects. The amounts of the amorphous structure were estimated by high-resolution neutron powder diffraction (NPD). Figure 9 shows ΔL/L vs. temperature for the bonded particles compared to the bulk, which was measured by using high-resolution strain gauge. One can notice that the maximal ΔL/L declines while the operating ΔT significantly broadens with reducing particle size. For small particles P3 (2–5 μm) and P4 (1–2 μm), NTE dominates in the entirely measured temperature range from 310 K to 100 K.
Figure 9. Linear thermal expansion ΔL/L as a function of temperature for the bonded MnCoGe0.99In0.01 samples with different particle size in comparison to the bulk (the reference temperature is 390 K). Particle size: P1 (10–20 μm), P3 (2–5 μm), P4 (1–2 μm), and P5 (0.3–1 μm). The morphology of the bonded sample is shown in the inset. Adapted from Shen et al. (2017). APL Materials, Vol. 5, Article ID 106102, (2017); licensed under a Creative Commons Attribution (CC BY) license. For the smallest particles with size P5 (0.3–1 μm), the NTE disappears and turns out to be ultra-low PTE, and the CTE α is as small as + 0.68 × 10−6/K from 200 to 310 K. This result suggests that the material can be also useful as a ZTE material, in addition to be used as compensators for PTE material. Moreover, one can notice that the low NTE for P4 (1–2 μm) and the ultra-low PTE for P5 (0.3–1 μm) is nearly independent of temperature in the corresponding temperature region (see the pink lines in Figure 9), which is appreciable for practical applications. The tunable CTE with particle size originates from the coexistence of crystalline phases and amorphous structure, particularly for the small particles. Variable temperature XRD and neutron NPD studies revealed that the phase ratio changes remarkably with crystallite size. About 7, 14.5, 38.5, 44.8, and 55.2% austenitic phase lost the martensitic transformation and remains the hexagonal structure down to low temperature for the particles P1 (10–20 μm), P2 (5–10 μm), P3 (2–5 μm), P4 (1–2 μm), and P5 (0.3–1 μm), respectively. Figure 10 shows the unit cell volume as a function of temperature (V-T curve) for the orthorhombic structure (red dot), hexagonal structure (blue dot), and the weighted average volume V- (black dot) calculated based on the refined phase fraction. Moreover, the temperature dependence of lattice volume was fit based on the Grüneisen law, and the results agree well with the refined results for either orthorhombic or hexagonal phase. Figure 10. 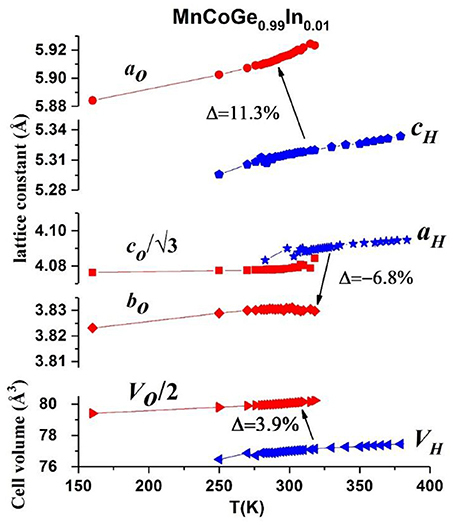 Refined unit cell volumes of martensitic structure (red dot), austenitic structure (blue dot), and the weighted average (black dot), as a function of temperature for the overall crystalline phases of various particles of MnCoGe0.99In0.01: (A) P1(10~20 μm), (B) P2(5~10 μm), (C) P4(1~2 μm), (D) P5(0.3~1 μm). The fitting curves according to Grüneisen law are represented by the small dots. Adapted from Shen et al. (2017). APL Materials, Vol. 5, Article ID 106102, (2017); licensed under a Creative Commons Attribution (CC BY) license. From Figure 10 (black curve), one can notice that PTE occurs below 290 K and turns to be NTE above this point. TEM studies indicated that crystallite size reduces with particle size, and the average crystallite sizes are about 15 nm and 8 nm for P4 (1–2 μm) and P5 (0.3–1 μm), respectively. With reducing the crystallite size, the both PTE and NTE coefficients decline, which are mainly caused by the instability of magnetostructural transformation due to residual stress and defects. On the other hand, the contribution from amorphous structure cannot be ignored, noting the amount reaches 40% for the smallest particles P5(0.3~1 μm). Detailed analysis indicated that the amorphous structure shows positive thermal expansion (PTE), and its compensation effect plays an essential role in the realization of ultra-low expansion even if the possible contribution from the small fraction of epoxy was considered. Details were given in the Supplementary Material in Shen et al. (2017). In 2016, Lin et al. prepared fine-powdered Mn0.98CoGe by two ways of high energy ball milling (BM) and repeated thermal cycling (TC) across the martensitic transformation, and compared the NTE behaviors (Lin et al., 2016). It was found that the both ways can make the temperature window (ΔT) of NTE broadening. For the powders experienced TC for ten times, the ΔT broadens to 90 K (309–399 K), and the CTE is about αL ~ −141 × 10−6/K. The SEM result showed that the average particle size for the powder of Mn0.98CoGe alloy through 10 times of TC treatments is 8.2 μm, and for the powder through 0.5, 5, and 12 h of BM process are 7.4, 3.9, and 2.2 μm, respectively. Figures 11A–D display the refined phase fractions for both orthorhombic and hexagonal phases based on the variable temperature XRD patterns for typical samples. For the powders experienced TC for 10 times, the transition of two phases is ~98%. For the powders prepared by BM for 0.5 h, the martensite transformation is broadened, and the transition ratio decreased to ~93%. With increasing BM time to 5 and 12 h, the martensite transformation window was further broadened, and the transition ratio reduced to ~60 and 36%, respectively. Figure 11. The temperature dependent phase fraction for the Mn0.98CoGe samples prepared by (A) TC for 10 times, (B) BM for 0.5 h, (C) BM for 5 h, and (D) BM for12 h; The temperature dependent volumetric thermal expansions ΔV/V (the reference temperature is 438 K) for the corresponding samples is shown in (E–H), respectively. The NTE temperature region is highlighted for all samples. Reprinted with permission from Lin et al. (2016). Figures 11E–H show the corresponding volumetric thermal expansion coefficient (αV) calculated based on the refined phase volume and fraction. For the powders experienced TC for 10 times, NTE effect appears between 309 and 399 K (ΔT = 90 K), and the corresponding αV is about −423 × 10−6/K. For the powders prepared by BM for 0.5 h, ΔT extends to 135 K (from 258 to 393 K), and αV value becomes −238 × 10−6/K. Further increasing BM time to 5 and 12 h results in the decreases of both ΔT and αV, and the αV values are about −135 × 10−6/K (236–366 K, ΔT = 130 K) and −93 × 10−6/K (264–303 K, ΔT = 39 K), respectively. The corresponding linear αL values are about −141 × 10−6/K (ΔT = 90 K), −79.6 × 10−6/K (ΔT = 135 K), −45 × 10−6/K (ΔT = 130 K), and −31 × 10−6/K (ΔT = 39 K) for the samples experienced TC for 10 times, BM for 0.5 h, BM for 5 h, and BM for 12 h, respectively. For the samples experienced TC for 10 times, the both temperature window of NTE and the αL magnitude are larger than those of typical NTE material Bi0.95La0.05NiO3 (αL = −137 × 10−6/K, 320–380 K) (Azuma et al., 2011). This αL magnitude for the samples experienced TC for 10 times is several times larger than that of common metals (Takenaka et al., 2012) and even larger than that of most polymers (Sullivan and Lukehart, 2005; Chu et al., 2012; Takenaka and Ichigo, 2014). The NTE behavior has different origins for the samples prepared by the two ways. For the powder prepared by BM, the broadening of temperature window of martensitic transformation originates from the accumulated residual strain. With increasing the BM time, the overall NTE window first expands and then shrinks. For the powder prepared by TC, the sample does not suffer any external pressure, and the introduced strain is thus weaker than the case by BM, hence leading to the completely different evolution of phase transition with temperature. All these results suggest the TC or slightly BM treatments can both extend temperature interval and optimize the NTE properties, which have high potential applications as the PTE compensators by forming composites. In recent years, many materials with magnetostructural transition, such as Gd5Si2Ge2 (Pires et al., 2015), FeRh (Zhou et al., 2013), metamagnetic NiMn-based Heusler alloys (Akkera et al., 2015), and MnAs (Mosca et al., 2008), have been explored in nanostructured thin films, aiming to activate novel properties and explore applications in micro-scale of these materials. Recently, Liu et al. firstly explored the fabrication of MnCoGe-based alloy films, and studied the magnetocaloric effect and thermal expansion behaviors of the films obtained (Liu et al., 2018). MnCoGe0.995In0.005 films with thickness of 45 nm were successfully grown on (001)–LaAlO3, (001)–SrTiO3, and (0001)–Al2O3 substrates by using pulsed laser deposition (PLD) technique. It was found that the obtained films exhibit three dimensional growth mode, and the island size varies for thin films grown on different substrates. Room temperature XRD patterns imply that the films crystallize in mixed hexagonal and orthorhombic structures, which are textured along the out of plane (001) direction for the hexagonal structure and (h00) orientations for the orthorhombic structure. For all the films, there exists obvious thermal hysteresis between the heating and cooling process in a wide temperature range, indicating that first-order magnetostructural transformation was retained. Moreover, the temperature window of the transformation for the films significantly broadened compared to that of the bulk alloy. The broadened magnetostructural transformation of Mn-Co-Ge-In films can be ascribed to the stress effect and crystalline defects. Besides, the commercially supplied Al2O3, SrTiO3, and LaAlO3 substrates have positive linear thermal expansion coefficients + 7.5 × 10−6/K, + 9.4 × 10−6/K, and + 1 × 10−5/K, respectively. Consequently, the different films denote tunable negative thermal expansion due to different island size and strain state of the films along with the compensating effect from substrates. As can be seen from Figure 12, for Mn-Co-Ge-In/Al2O3 and Mn-Co-Ge-In/SrTiO3, the NTE coefficients are −6.56 × 10−6/K (from 270 K to 390 K) and −4.82 × 10−6/K (from 290 K to 390 K), respectively. These values are a bit smaller in comparison to those of the well-known commercial NTE materials ZrW2O8 (−9 × 10−6/K). Otherwise, the Mn-Co-Ge-In/LAO with the smallest island size denotes near-zero CTE of −2 × 10−6/K in the temperature range from 290 to 390 K.
Figure 12. 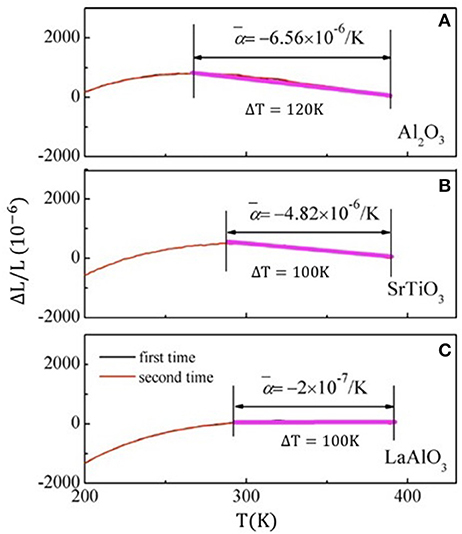 Temperature dependent linear thermal expansion ΔL/L for the Mn-Co-Ge-In thin films grown on Al2O3 (A), SrTiO3 (B), LaAlO3 (C). Each has been repeated at least two times. Reprinted with permission from Liu et al. (2018). The deposition of films completely overcomes the brittleness nature of Mn-Co-Ge-In alloy and much more durable. Repeated experiments demonstrated that the NTE behavior is completely repeatable between different cycles for the all films (Figure 12). All the results denotes that durable thin films with different CTE can be designed through choosing appropriate substrates or introducing a buffer layer, which would be quite useful for practical applications. Similar to MnCoGe-based alloys, MnNiGe-based alloys also denote NTE due to the martensitic transition from Ni2In-type hexagonal to TiNiSi-type orthorhombic structure. Still, Fe-doped MnNiGe alloys naturally crack into small pieces after annealing. Recently, by preparing the alloy through solid state interaction, Zhao et al. (2018) reported the NTE of MnNiGe-based alloy. The average CTE of Mn0.9Fe0.1NiGe alloy with Fe replacing Mn reaches a giant value of αL ~ −285.23 × 10−6 K in a temperature window from 192 to 305 K (ΔT = 113 K), while the αL of MnNi0.9Fe0.1Ge alloy with Fe replacing Ni reaches −1,167 × 10−6/K in a narrow temperature window (246–305 K, ΔT = 59 K). The introduction of Fe changes the magnetic state of martensitic phase from the spiral AFM structure into FM state. Furthermore, commercial Cu powders with positive thermal expansion has been chosen as the matrix metal, both acting as the compensators to control CTE and bonder to increase the mechanical properties of the alloy. The study (Zhao et al., 2018) revealed that the introduced Cu powers rarely react with the Fe-doped MnNiGe alloy. The cracks and holes can be filled by Cu particles, and the resulted MnNiGe/x%Cu composites is more compact with increasing Cu contents. The CTE of both Mn0.9Fe0.1NiGe and MnNi0.9Fe0.1Ge alloy decreases by introducing 35% Cu, as shown in Figure 13A. The linear thermal expansion behavior of Mn0.92Fe0.08NiGe/x% Cu and Mn0.84Fe0.16NiGe/x% Cu are presented in Figures 13B,C. The absolute CTE values of the two serials of composites decrease and the NTE temperature windows become narrow with increasing the Cu ratio. Increasing the Cu content to 70%, the composites display near-ZTE behaviors due to the compensation effect between the PTE properties of Cu matrix and the NTE properties of Fe-doped MnNiGe alloys. A low thermal expansion behavior with a CTE αL ~ −4.73 × 10−6/K was observed in a temperature range from 173 to 229 K (ΔT = 56 K). 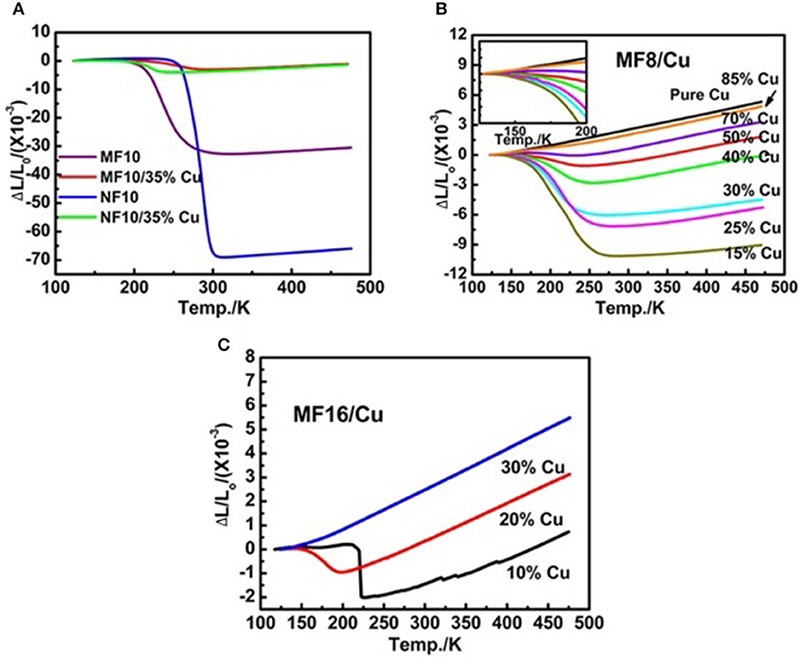 In MnNi0.92Fe0.08/10%Cu composite, a low αL ~1.16 × 10−6 /K is also achieved in a wide temperature range from 125 to 215 K (ΔT = 90 K). Figure 13. The temperature dependence of ΔL/L0 curves of (A) Mn0.9Fe0.1NiGe, MnNi0.9Fe0.1Ge, Mn0.9Fe0.1NiGe/35%Cu and MnNi0.9Fe0.1Ge/35%Cu, (B) MnNi0.92Fe0.08Ge/x%Cu (x = 15, 25, 30, 40, 50, 70, 85, 100), and (C) MnNi0.94Fe0.16Ge /x%Cu (x = 10, 20, 30), where the L0 is the length of the sample at 123 K. Reproduced under a Creative Commons Attribution 4.0 International License from (Zhao et al., 2018). In addition, the mechanical performance can be enhanced for the Fe-doped MnNiGe compounds with Cu as binders. All these suggest the high potential of the composites as NTE materials. The cubic Laves phases RCo2 (R = rare earth elements) have intensively been studied for the rich magnetic properties, which arise from the highly localized 4f electrons of rare earth elements and the interactions with the itinerant 3d electrons of the transition elements. For the RCo2 with R = Nd, Pr, Sm, Gd, Tb, Tm, the magnetic transition is of second-order in nature, while for R = Dy, Ho, and Er, the magnetic transition becomes of first-order (Khmelevskyi and Mohn, 2000). RCo2 compounds have a cubic Laves C15 structure with space group Fd3¯m around room temperature. In the cubic C15 structure, rare atoms locate at sites 8(a) (0.125, 0.125, 0.125) and Co atoms at sites 16(d) (0.5, 0.5, 0.5) (Figure 14A; Ouyang et al., 2005a). With temperature decreasing, ErCo2 and TbCo2 exhibit a rhombohedral distortion (space group R3¯m) below Curie temperature TC (Ouyang et al., 2005a; Kozlenko et al., 2015). At low temperature, Er (Tb), Co1, and Co2 atoms occupy Wyckoff sites 6c (0, 0, z), 3b (0, 0, 0.5) and 9e (0.5, 0, 0), respectively. Figure 14B shows the crystal and magnetic structure of the TbCo1.9Fe0.1 compound at 10 K, the moments of Tb and Co atoms are antiparallel alignment along the c axis, which is similar to that of ErCo2 and TbCo2. However, NdCo2 and HoCo2 (Ouyang et al., 2005b; Mudryk et al., 2016) undergo two crystallographic transitions: the room temperature cubic lattice (space group Fd3¯m) transforms into the tetragonal one (I41/amd) at TC, and then becomes orthorhombic (space group: Fddd) below spin orientation TSR. Figure 14. (A) Schematic of crystal structure for RCo2 cubic Laves phase(space group Fd3¯m). (B) Crystal and magnetic structure of TbCo1.9Fe0.1 compound with rhombohedral distortion (space group R3¯m) at 10 K. (B) reprinted with permission from (Song et al., 2018). Copyright 2018, ACS Publishing Limited. Numerous studies have been carried out on phase transition and magnetocaloric effect (MCE) for RCo2 compounds (Wada et al., 1999, 2001; Duc et al., 2002; Gomes et al., 2002; Wang et al., 2002a,b, 2003; Liu and Altounian, 2005). Experimental and theoretical investigations show that the compounds with R = Er, Ho, and Dy show giant MCE owing to the first-order nature of magnetic transition. In 2001, Wada et al. reported the MCE of single crystal ErCo2. The maximum magnetic entropy change, –ΔS, is as high as 10.6 J mol−1 K−1 (37.2 J kg−1 K−1) and the maximal adiabatic temperature change, ΔTad, reaches ~9.2 K under a magnetic field change of 0–5 T (Wada et al., 1999). Owing to the large MCE, ErCo2 is usually considered to be a standard material for comparison in the low temperature region around 30 K. Furthermore, the maximum entropy change of DyCo2 and HoCo2 is 11 and 20 J kg−1 K−1 (Duc et al., 2002) under 0–5 T, respectively. The large MCE of RCo2 compounds is relevant to the large magnetic moment of R atoms, and more importantly, the crystallographic transition with negative volume expansion of different amplitudes also plays a key role for the various MCE. A small magnetic moment is induced in Co atoms, which is usually antiparallel to R atoms, resulting in the ferrimagnetic nature of the compounds. In addition, some studies indicated that the replacement of R atoms by other Lanthanide elements can regulate the phase transition and MCE. Liu et al. 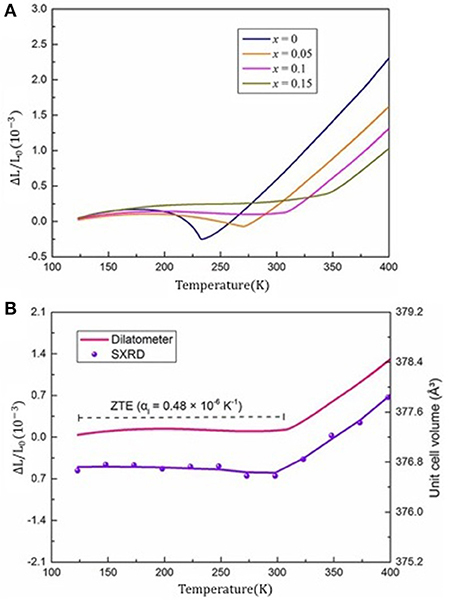 (Liu and Altounian, 2005) reported that the Curie temperature of (Er1−xGdx)Co2 increases from 32 to 403 K with the substitution of Er by Gd. However, the maximum value of -ΔS under 0–5 T decreases from 15.3 J kg−1 K−1 at x = 0.1 to 3.2 J kg−1 K−1 at x = 0.6. Furthermore, it has been found that the substitution of Dy by Gd will rapidly reduce the MCE in DyCo2 (Wang et al., 2002b), but replacing Tb with Er increases the MCE of TbCo2 (Gomes et al., 2002). On the other hand, Wang et al. (2002a) reported that using 7% of Si to replace Co can increase the Curie temperature of DyCo2 up to 168 K, but weakens the first-order phase transition properties and causes a significant reduction in the magnetocaloric effect. It is worth mentioning that the replacement of Co by Ni lowers TC of Ho(Co1−xNix)2, while the large MCE is retained up to x = 0.1 though the phase transition changed from first-order to the second-order in nature (Wada et al., 2001). In RCo2 compounds with R = Dy, Ho, and Er, the magnetic ordering around TC is accompanied by negative thermal expansion of lattice. Recently, Song et al. reported a wide temperature ZTE in the Tb(Co, Fe)2 and found a negligible thermal expansion coefficient, αL, in TbCo1.9Fe0.1, which is nearly two orders smaller than that of the common alloys (Song et al., 2018). Figure 15A displays the temperature dependent linear thermal expansion (ΔL/L0) for Tb(Co2−xFex) compounds. It is found that the NTE and PTE can be obtained by adjusting the Fe concentration in Tb(Co2−xFex). Remarkably, the TbCo1.9Fe0.1 compound exhibits a ZTE property over a wide temperature range from 123 to 307 K. The average linear CTE of Tb(Co1.9Fe0.1) is αL = 0.48 × 10−6 K−1 and intrinsic unit cell also confirmed the reliability of ZTE which was determined by SXRD (synchrotron X-ray diffraction), as shown in Figure 15B. This CTE of Tb(Co1.9Fe0.1) is about two orders of magnitude smaller than that of the Al (αL = 23.1 × 10−6 K−1) and Cu (αL = 17.7 × 10−6K−1). Furthermore, this value is also smaller than the CTE of Invar alloys with composition Fe0.65Ni0.35 (αL = 1.5 × 10−6 K−1, 193–373 K) (Guillaume, 1897). Figure 15. (A) Temperature dependent linear thermal expansion (ΔL/L0) of Tb(Co2−xFex). (B) The ZTE in the TbCo1.9Fe0.1 measured by both dilatometer and SXRD. Reprinted with permission from (Song et al., 2018). Copyright 2018, ACS Publishing Limited. 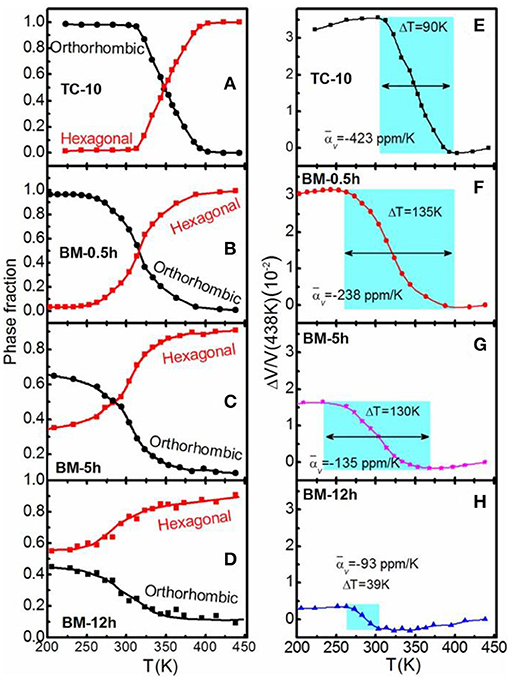 The magnetic moment of Tb atoms, MTb, plays a dominationg role in the ferrimagnetic nature of the Tb(Co2−xFex) compounds. The spontaneous volume magnetostriction (ωs) was used to quantitatively describe the contribution of magentovolume effect to the abnormal change of lattice. For TbCo1.9Fe0.1, and the ωs is denoted by ωs = ωexp-ωnm,where ωexp is the unit cell volume obtained by NPD, and ωnm is calculated based on the Debye-Grüneisen relationship. A strong correlation between MTb2 and ωs was denoted by the equation ωs(T) = k C M(T)2, where k and C represent compressibility and magnetovolume coupling constant, and M(T) the amplitudes of magnetization (Gruneisen and Goens, 1926; Sayetat et al., 1998). That is to say, the spontaneous magnetostriction is closely related to the magnetization. The decrease of magnetization with temperature is responsible for the negative contribution to volume expansion, which neutralizes the normal lattice expansion, and hence produces the ZTE. Antiperovskite compounds A3BC (A = Fe, Mn; B = Ga, Sn, Cu, Zr, Fe, Co; C = C, N, H) are well-known (Takenaka and Takagi, 2005; Iikubo et al., 2008; Sun et al., 2010a,b, 2012; Song et al., 2011; Wang et al., 2012; Lin et al., 2015; Shi et al., 2016, 2018; Guo et al., 2018) for the rich characteristics of NTE and ZTE, as well as the baromagnetic, and barocaloric properties, though the comprehensive performance of MCE is not as good as the conventional material Gd around room temperature. This material has a very large family, which shows rich magnetic and lattice structure depending on compositions and atomic occupations. Experts, such as C. Wang's group and Y.P. Sun's group, have done a lot of excellent studies in the antiperovskite compounds, particularly on the NTE properties. Moreover, fascinating properties were also reported in some compositions, such as baromagnetic (Shi et al., 2016), barocaloric effect caused by spin frustration (Matsunami et al., 2015), and large magnetocaloric effect (Sun et al., 2012). Specifically, C. Wang' group have reported a large amount of research work on NTE and MCE in antiperovskite compounds and also thought that lattice entropy is important to be excited due to large negative thermal expansion behavior driven by magnetic effects in the antiperovskite compounds so as to improve the magnetocaloric effect. A specific review article focusing on the antiperovskite compounds should be summarized separately, and we do not address more here. In summary, negative thermal expansion (NTE) behaviors in the materials with giant magnetocaloric effects (MCE) have been reviewed. Representative materials including La(Fe,Si)13, MM'X, and RCo2 have been included. Antiperovskite compounds are also briefly introduced. MCE materials are used for magnetic refrigeration while NTE materials for thermal compensation. Although the materials have distinct applications, the physical sources are similar particularly for the novel MCE and phase-transition-type NTE materials, both originating from the strong spin-lattice coupling. A number of MCE materials show abnormal lattice expansion owing to magnetic interactions, which provides a natural platform for exploring negative thermal expansion materials. The magnetostructural transformation in the giant MCE materials can be adjusted by utilizing its sensitivity to chemical/physical pressure, hence abnormal lattice expansion in an extended temperature range can be achieved. The present review provides implications for developing novel NTE materials and multifunctional devices. FH wrote the article in cooperation with FS, JH, and YL. All authors reviewed the manuscript. This work was supported by the National Key Research and Development Program of China (Grant Nos. 2017YFB0702702, 2018YFA0305704, 2014CB643700, and 2017YFA0303601), the National Natural Sciences Foundation of China (Grant Nos. 51531008, U1832219, 51771223, 51590880, and 11474341), and the Key Program and Strategic Priority Research Program (B) of the Chinese Academy of Sciences. Guillaume, C. É. (1897). Investigations on Nickel and its alloys. CR. Acad. Sci. 125:18. Hu, F. X. (2002). Magnetic Properties and Magnetic Entropy Change of Fe-Based La(Fe,M)13 Compounds and Ni-Mn-Ga Alloys. Ph. D thesis, Institute of Physics, Chinese academy of Sciences. Copyright © 2018 Hu, Shen, Hao, Liu, Wang, Sun and Shen. This is an open-access article distributed under the terms of the Creative Commons Attribution License (CC BY). The use, distribution or reproduction in other forums is permitted, provided the original author(s) and the copyright owner(s) are credited and that the original publication in this journal is cited, in accordance with accepted academic practice. No use, distribution or reproduction is permitted which does not comply with these terms.